Dog owners sometimes complain that they just don’t have the time to train their dog. But training is worth the time and effort because it teaches your dog to be well behaved. And the more time you spend training your dog, the easier it will be for him to pass the Canine Good Citizen test. To make training a priority, look at it as a fun game — something you and your dog enjoy doing together. Training shouldn’t be a chore. Then identify the times during the day when you interact most with your dog. Feeding time: If your dog is still a puppy, you feed him four, three, and eventually two times a day. Each meal is a training opportunity — teach him to sit and stay before you put his dish down. Make him wait for a second or two, and then let him eat. You’ll be surprised how quickly he catches on to this routine. You also can put the dish down first and follow the same procedure. While relaxing with your pooch: The Down command can be taught while you’re watching TV. Take a few treats to your favorite chair and work on getting your dog to stay in the Down position for longer periods of time each night. You can also use this time to brush your dog and handle his feet so he gets used to the sensations. 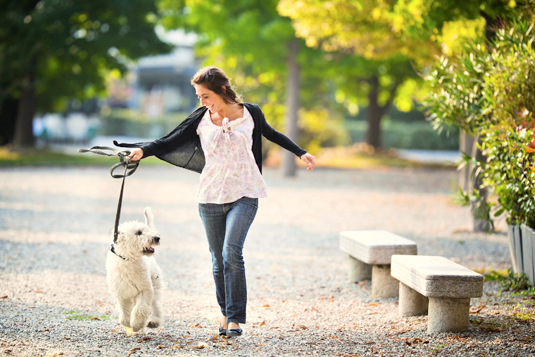 During walks: Every time you take your dog for a walk is a training opportunity to teach him not to pull, to sit at the curb, and to heel when passing other dogs. All of these commands teach your dog to focus on you and look to you for direction — and they all happen as a part of your daily routine.